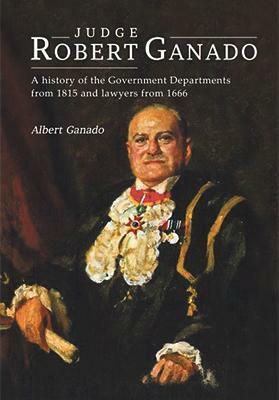 A history of the Government Departments from 1815 and lawyers from 1666. Printed in a very limited edition of 300 copies, Judge Robert Ganado is first and foremost a tribute by his son Albert Ganado, who inherited from his father not only his predisposition for the legal profession but also his passion for Melitensia, which has made him Malta’s foremost collector and the most respected world authority on Malta maps. Born in 1875 in Valletta, the son of Judge Luigi Ganado, Roberto Federico was conferred with a doctorate of laws in 1898 and furthered his legal studies in London. On his return to Malta he was appointed advocate of the poor, an onerous office which he carried out with the utmost dedication at the cost of his private practice in spite of the unprincely salary he received. In 1918 he was appointed magistrate of judicial police and subsequently held various official posts until his appointment as judge in 1925, an appointment greeted with unanimous acclaim. Ganado distinguished himself in the commercial court, being appointed chief justice and president of the court of appeal in 1940 on the strength of his seniority following the unjust removal of Sir Arturo Mercieca. He retired on reaching pensionable age and died at the age of 72 in 1948 at his Rabat home. Ganado married Mary Vassallo late in life and had eight children, four of whom predeceased him. Albert was the sixth child. But, perhaps, there was yet another reason that led to the author writing this book, and this was to counter the unfair criticism that Anton Buttigieg had levelled at Judge Ganado in his autobiography with regard to his handling of the notorious sedition case of 1933. Hearing the appeal of these six people who had been found guilty in the court of first instance, Ganado declared the applications as null and void, which led Buttigieg to cast doubts on his motives and impartiality. The author had already countered this accusation in a letter to The Sunday Times of Malta, but that was a newspaper, and putting the letter in a book, accompanied by the original sentence, is a more permanent way of righting a gross injustice. Still, there was another facet to Judge Ganado. He was one of the earliest dedicated collectors of Melitensia, and this was at a time when one could still find books and prints at reasonable prices before the recent crazy explosion of prices. Ganado was no mere hoarder or superficial hobbyist, or, what is worse and what has become more common nowadays, one who buys indiscriminately merely as an investment. He was a passionate lover of books and knowledge, and he used his books, records and connections to further his research. Painstakingly checking information from the Malta Government Gazette, the Blue Books, the reports of the various Royal Commissions, and official despatches, Ganado was able to draw up lists of judges and magis­trates since 1885, lawyers from 1766 to 1947, university graduates, parish priests, military officers, and those initiated into orders of knighthood, inter alia. Albert writes that he remembers his father using reams of papers to copy documents, sometimes with the Lieutenant Governor even allowing him to take these official records home; and all this without ever neglecting his duties! In moments like these, one often questions as to how much our forebears could have achieved had they had electric light to lighten the burden of continuing reading and studying in the dark hours and, especially, computers at their disposal. It is this huge mass of information that makes this book so important a contribution to Melitensia, in particular to anyone interested in the development of the civil service under the British. These meticulous records were unfortunately never published, since they were obviously drawn up to satisfy Ganado’s desire for knowledge, but now they are being made available to researchers in one easy place. Henry Frendo, who was written so extensively about Malta under the British and who contributed the foreword to the book, rightly acknowledges the importance of this data which, to use a tired old cliché, is a veri­table mine of information. He points out that “no comparative history of the Maltese pubic service and ancillary entities could do without reference to the data contained here”, and that its publication is “a lasting service to biographers and bibliographers, as well as to all the researchers of Maltese legal and civil service histories, and institutions over the past two centuries”. The very rich collection of pictures of places, personalities, and official deeds and documents related to individuals mentioned in the book, is a great bonus in itself. This is in itself quite a notable contribution, especially with regard to the pictures and caricatures from the author’s important archives.